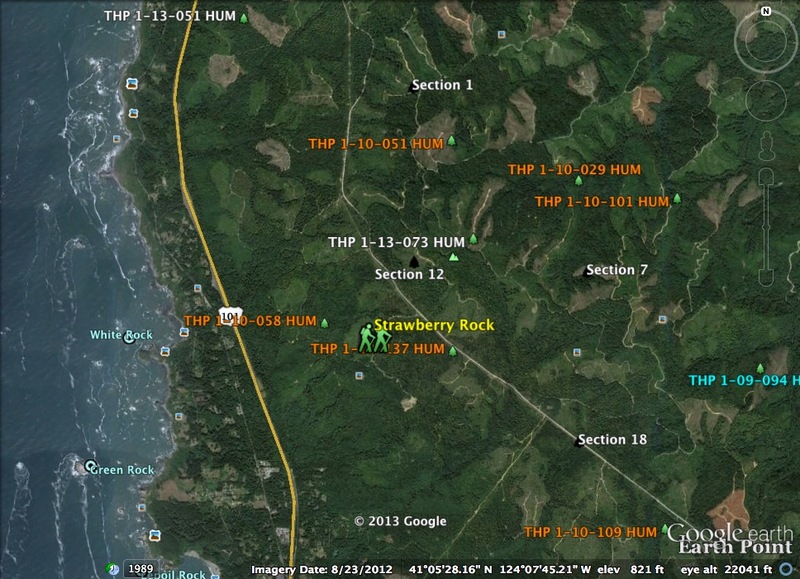 THPBlog: Green Diamond Resource Company to clearcut just north of Strawberry Rock. Green Diamond Resource Company to clearcut just north of Strawberry Rock. THP 1-13-073 HUM (CR 1900 15 THP) Green Diamond Resource Company, 50 acres; 92% clearcut, 7% selection, 1% no-harvest logging. McDonald Creek (HUM: T8N R1E Sec.7, 18; T8N R1W Sec.1, 12). Winter operations, moderate erosion hazard, steep slopes up to 70%, unit B oversized, herbicides, impaired 303.d watershed, coho watershed, 1 spotted owl within 1.3mi, osprey within .25 mi, trees up to 48"dbh. Estimated public comment deadline: 10/07/13. 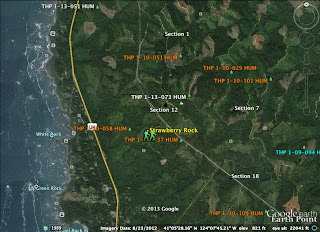 This THP is a few miles north of the town of Trinidad, CA and just to the east of Highway 101 at an elevation of 900 to 1,400 feet. It is also close to Strawberry Rock, a popular hiking destination with great views of the Pacific Ocean. Green Diamond Resource Company is planning a mostly clearcut feller buncher, shovel and cable logging operation in second growth redwood, Douglas fir and grand fir. The THP is in an area that has been heavily clearcut by Green Diamond Resource Company in the past, and drains the Mill and Savage Creek watersheds which flow into the Pacific Ocean. Unit B is an oversized unit, and an osprey was reported to be within .25 mi of Unit A & Unit B. More information is available on the THP Tracking Center website.